Two factions, one blue and the other red with their respective supporters as partisan as ever, met in the nation’s capital over the weekend to argue over the latest controversial Whitehouse decisions. But enough about contemporary US politics...I should probably start actually harping on rugby now!!! This wasn’t the first Leinster v Munster clash where the losing team felt hard done by the ref and it won’t be the last, so I was hardly being psychic in my preview. And these days on top of the rivalry there’s added frustration what with the phenomenal season the boys in blue just had; it’s totally understandable and I’d be exactly the same if the roles were reversed. And the backlash to the criticism has also been expected : “Ah yeah, blame the ref why don’t you…” has been a common refrain from Leinster fans for the past day or so. All of this has me unfortunately trudging the murky waters between those two extremes in search of an answer to the real question at hand...did the officials actually cost Munster the nine point swing they ended up needing to win? Three decisions definitely stand out, so what I’ll try to do is tell my story of the match based around examinations of each one. Many different factors are involved in the penalty try, which require lots of harping. Since it was the first score of the match and Leinster held on to the lead for good, I guess that’s ok.
Before we get to the decision itself, we need to look at the context. The fact that James Lowe was in a position to score a try at all was down to two reasons - one being an amazing exchange of running and offloading between himself, Dan Leavy and Jamison Gibson-Park that bamboozled the Munster defenders. Yet we must go further back to realise that it should have been Munster on the attack in our territory at that stage. It was a high box kick from around our own 22 that looked to be heading to Andrew Conway, yet Keith Earls also attempted to catch. I’m not sure what the expected norm is in the game these days, but I would have thought that having the number 15 on your back gives you automatic ‘first dibs’ on a high ball but Earls might have thought he was better-positioned and his involvement meant both were removed from the equation; instead James Lowe made the most of the confusion by gathering and setting off deep into the Munster half. So that was the build up; now for some precedent with this particular referee. I remember a match back in 2015 when Connacht legend John Muldoon was penalised for a tackle at midfield and on TMO review it was judged to be a professional foul and thus a yellow. Then Ben Whitehouse took it on himself to narrate a fictional series of events that ‘would have’ followed and awarded the penalty try. And who was the opposition? Munster no less, and even their own fans thought it was a crazy decision at the time. Which brings us to this incident. The key players are JGP who is supplying the final offload, Lowe the intended receiver, and Earls who is coming in on the wrong side of the Kiwi winger. I’ll start at my verdict and walk back...Penalty and yellow card? Yes. Penalty try? No. Both decisions come from Gibson-Park’s offload, because it wasn’t actually heading for Lowe, it was actually going straight to Earls. Had his intentions been pure, he could have taken it and at least diffused the situation by stepping into touch, though I reckon he’d be more inclined to take it himself into contact to allow his team-mates to regroup and there’s no better man in that kind of scenario. However it’s clear he chose instead to focus on the man and not for the last time in this match by Munster players, the attempt to make the contact look accidental was unconvincing. Yet Whitehouse has a tendency to add his own spin when it isn’t really necessary (a bit like the orange guy in the building with the same name as it happens) and this is why I’m not a huge fan of relying on the big screen as part of the review process. IMO the ref should only use his own “real time” experience to make the call and let the guy in the warm studio who isn’t running around the pitch offer assistance. With screens of different sizes positioned at different locations in different grounds, it not only leads to wasted time but can also put refs under pressure to make a call even if they can’t quite see the replay properly. Not long after the pen try, Gibson-Park did find Lowe with a scoring pass only from a much longer distance and despite the fact that red jerseys with 2, 8 And 9 were in the vicinity to allow for Earls being on the naughty step, the finish was made look easy. Munster did pull us back courtesy of tries from close range by Tadhg Beirne and CJ Stander, but once again Leinster were able to continue scoring in two specific scenarios; one right after conceding and the other right before the break, and two Ross Byrne penalties ticked those boxes to give us an 8-point cushion as we headed for the dressing room. This two-score lead is what made the second contentious call in the 42nd minute so important. We forced Mathewson to skew his exit kick from the restart into touch and we were looking at creating another chance when a thunderous hit by Sam Arnold on Robbie Henshaw wrested the ball free before Earls recovered and brought it all the way to the other try line. It was of course a deliberate knockon, with red card and ten-week bans thrown in for good measure...at least that's what I saw with my blue-tinted goggles in the South Stand at the time. But I never actually expected the officials to call it yet the touch judge had enough confidence in what he saw to call the play back. Anyway on second look, I think it was probably a knock on, but absolutely not intentional...I have a feeling Whitehouse knew this and chose to protect his assistant, which if so is admirable loyalty but questionable officiating. So when Leinster’s best outcome should have been a scrum and our worst could have been a try down the other end, instead we had a penalty to stick in the corner and from there, once again it was Gibson-Park to Lowe and this finish was worth the price of admission all on its own (for those clad in blue of course). He was already on the move yet the pass was actually a bit behind him, so you’d think the best option would be to retrieve and recycle. But James Lowe is the kind of player who has a default setting of “always try the riskier option” and what’s more, he generally makes it work. Last year at this fixture I embarrassed myself in the stands by spilling my pint. This time my mates will probably tell you that I did so by standing up and screaming “NO WAY!! !” over and over after Lowe’s dive to get the ball down. Maybe, just maybe, there was a colourful adjective between those two words. It could be said that Jean Kleyn’s attempted tackle helped keep Lowe’s feet off the ground in mid-dive, but you could counter by saying the winger allowed for that. He certainly wasn’t in any doubt while the TMO had a look as he was intentionally standing way back in his own 22. Absolutely everything about this try is what makes him such a crucial player in any team, let alone one that struggled to earn both possession and territory. All of which makes that ‘deliberate knockon’ call devastating for Munster; then to add insult to injury, Ross Byrne goes and nails the conversion from the touchline making it a three-score game. For the third batch of dodgy decisions from the officials we’re looking at a series of scrums under the Leinster posts, yet once more we must look at the context behind how we got there. It began in the 58th minute with Munster down by 12. First there are two successive penalties - one for offside and another at the maul following the lineout from the first one - which march them close to our line. One point I’d like to make here is that for the entire evening this was pretty much the only way the visitors could gain territory. Not for the first time this season the blue defensive wall was proving tough to breach, with two tacklers smothering the carrier more often than not, much like in Galway the week before. This is why chances like this were so important to Munster, and we can’t focus on this one without remembering that they had spurned many others at different stages. With Sexton rested, this was an opportunity for Joey Carbery to rise up and meet the challenge of finding ways through, and while there was some good territory found with his boot at times, for the most part his "go to" option seemed to be high kicks towards the full back, possibly forgetting the talents of Rob Kearney who was earning his 200th cap. Anyway, now we’re under the posts after two successive Leinster penalties, and going for the scrum was definitely the right option. Since I have used a lot of words already for this point, I won’t dwell on the individual scrum penalty decisions themselves, nor will I examine Peter O’Mahony’s “innovative” binding technique too closely. For me, the fact that the three successive penalties around the scrum were for different offences is irrelevant...I have written before on these pages about the need to sanction teams much faster for halting progress up the field, so it’s no different when it’s Leinster. The warning to Rhys Ruddock should have come at least one scrum sooner, which would have meant a yellow would be issued at some point. Again I felt Whitehouse was inserting his own opinions to the equation. A lot of refs don’t like it when teams use a scrum to look for a penalty try...John Lacey is another. This could be why he calls “use it” when the ball appears at the back of the last scrum; in a way I can see the reasoning (I’ll only award the pen if the infringement stops the ball from coming out) but even if we accept this, he practically bullied Alby Mathewson into using it faster than the laws allow. Although the scrum half went on to flummox Rory O’Loughlin and score the try anyway, Munster can still feel aggrieved on two fronts...not only should they have had ten minutes with an extra man but it probably should have been a lot sooner since with all the resetting and chatting, another full ten had gone off the clock since the start of the sequence the match restarted following the Mathewson try. It was right after that restart when Munster really blew it all by themselves. Having pulled the deficit back to just 5, the kick was heading into the 22 when prop Stephen Archer clearly blocked the chase of Fergus McFadden. Doing this had been his job at moments like this before, but here he did a really poor attempt at selling it. In his defence, not only had he been on for 68 minutes but there had just been a gagillion high-pressure scrums under the Leinster posts...that might have been a good time to make a switch. But the penalty was called and again it was sent between the uprights by Ross Byrne, who had a fine day from the tee and put in some strong tackles at critical moments, though I'm still scratching my head at his being awarded man of the match...he might have gotten 12 of our points but 4 of them were from our tries, all of which were thanks to James Lowe. More importantly though, I hope Byrne’s late withdrawal wasn’t for anything too serious because he’ll be needed for next Friday. 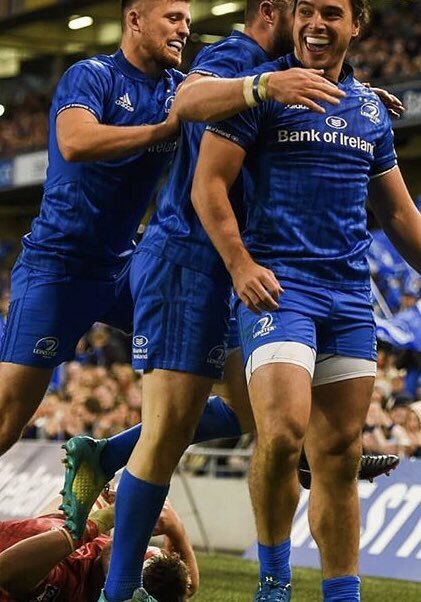 Elsewhere in the Leinster performance, while the Gibson-Park/Lowe connections were very obvious, I thought our locks Toner and Ryan were also working well together in lower-profile ways (37 tackles between them) around the park and when you add up all of the above, I’m wondering if there’s room in our squad for Scott Fardy against Wasps under the ‘ANZAC rule’. Also Dan Leavy played like someone seeing a red scrum cap over his shoulder and we even got the benefit of both on the pitch towards the end. As for Seanie, it's great to see him back starting but based on present fitness and form I'm wondering if Jack Conan would be a better number 8 option to face Wasps? Going back to my original question about whether or not the referee influenced the result, I’m going to say no, because on many occasions Munster took longer than they’d like to break us down even without Whitehouse & co’s involvement, and while we didn’t have much ball we always looked like we had an extra score in our back pocket when we needed one. This has been a feature of our games all season, even for the one we lost in Llanelli when it was our turn to question the ref’s judgement. I reckon a 1-3 point winning margin would have been a better reflection of what happened. Looking ahead to Europe I think Munster need to bottle the passion they brought to the Aviva (to be fair they bring it most years) but learn to use it more effectively because the likes of Exeter aren’t going to make things any easier. On our side, if we can keep the defence solid, and remain able to make the most of our chances, then adding the likes of Sexton and Ringrose back to the squad should bring us up the notch required to begin our #DriveForFive. For now I'd just like to say thanks to all involved at the Aviva for putting on another fine occasion, and there was plenty of good natured banter around the place afterwards. Later this week we'll have our 80-word reviews on Tuesday, Harpin Points on Wednesday, Telly post on Thursday and our Leinster v Wasp preview on Friday. Plus of course every morning our Front5 quotes & links. Do stay tuned!